I'm glad to see you here. 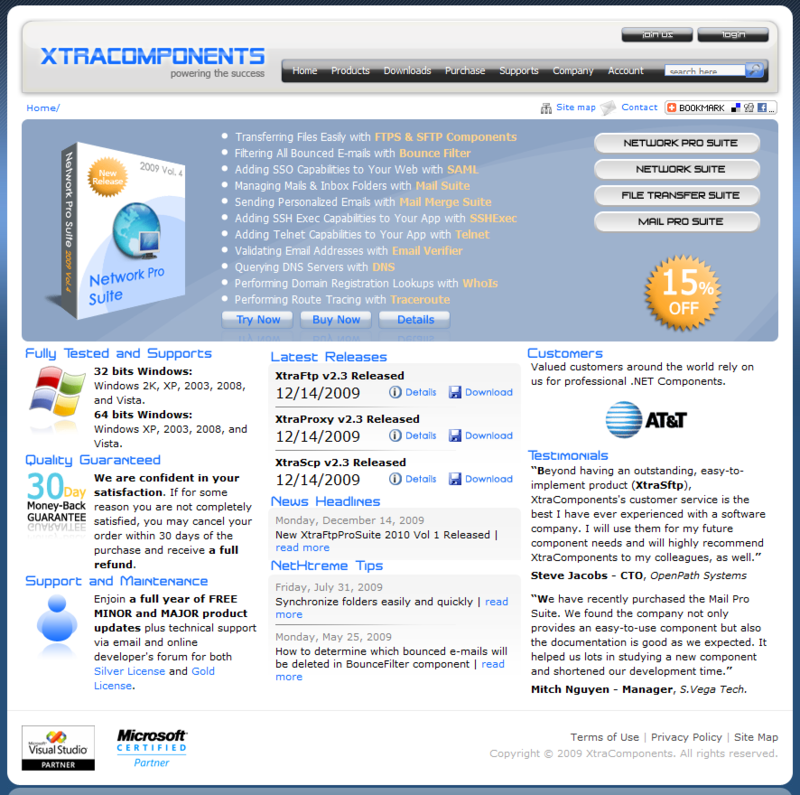 However, the XtraComponents company was found to deliver exclusive .NET Components and they are completely 100% our software that are developed by our developers. If you do not believe me, simply download and install our software. There is nothing similar to yours. By the way, I would want to inform you that, we are on the way to get the legal software copyright certificate from our government. > I hope they dont delete my posts here. If so, they actually want to hide the truth. 1. Can you prove that your company (XtraComponents) exists? We tried searching http://apps.sos.ky.gov/business/obdb/%28S%28pij3yiyqrrdsqr455rxjzda4%29%29/default.aspx but found no trace of it. Please explain. 2. Can you prove that you are in fact a Microsoft Certified Partner, as you claim on your website? 3. The founders and owners of your company are nowhere to be found. Why? A linkedin.com profile would be nice. At least one that is older that a month. 4. You claim to have a lot of corporate customers already. Can you prove that any of the companies featured at your website actually uses your software? > I'm glad to see you here. This sentence strongly suggests you are not an American because "company was found" is grammatically incorrect. Quite strange for someone called "John", isn't it? Anyway, do you claim that ComponentForge, Safabyte and XtraComponents are unrelated companies? But don't worry, we will post an update to http://cheated.by.safabyte.net/evidence.aspx later today. > If you do not believe me, simply download and install our software. > There is nothing similar to yours. We did. Sadly, we found out that it's still based on Rebex code, although you changed lot of things again to hide the evidence. But you still have not changed it enough. > get the legal software copyright certificate from our government. Let us know when you get such certificate from the US government, then we will finally be able to sue you. But I'm afraid they don't issue such certificates to non-existent entities. > assemblies, feature, classes, methods with Rebex's. Good idea! We will publish a guide to this at http://cheated.by.safabyte.net/ later today. So stay tuned, there is more to come! I'm sure that you will find nothing that is convincing. We wrote them from scratch. About the company profile, it's a true company and we do not have to show you-Rebex anything, you do not have the right. But his comments here also helped us to realize that we don't have to prove anything to him either. After all, he already knows very well he stole his FTP/STP code from us. Instead, our job now is to prove this to his future customers. And the best way to prove it to them is definitely not publishing a guide for Xtra on how exactly to fix his "product" to remove any obvious similarities. Anyway, in case you would still like to see a good old proof that Xtra stole a substantial part of his code from Rebex, you are welcome to ask at support@rebex.net! Sorry Xtra, I removed your comment. Although you addressed he questions, you have not answered any of them at all. But that would be still OK to leave your reply here. Unfortunately for you, you were unable to resist the temptation to fill the rest of your comment with your lies other nonsense. And frankly, we are already fed up with you. If you think that our software infringes anyone's copyright, just tell us about it for god's sake and we will remove any infringing code as soon as possible. Any legitimate company would do that. Only telling other people only makes you look like a small kid who is just about to lose his favorite toy. But you were warned - unless you actually ANSWER the questions, we will delete your further posts.